This paper compares the results of the three state of the art climate-energy-economy models IMACLIM-R, ReMIND-R, and WITCH to assess the costs of climate change mitigation in scenarios in which the implementation of a global climate agreement is delayed or major emitters decide to participate in the agreement at a later stage only. We find that for stabilizing atmospheric GHG concentrations at 450 ppm CO2-only, postponing a global agreement to 2020 raises global mitigation costs by at least about half and a delay to 2030 renders ambitious climate targets infeasible to achieve. In the standard policy scenario—in which allocation of emission permits is aimed at equal per-capita levels in the year 2050—regions with above average emissions (such as the EU and the US alongside the rest of Annex-I countries) incur lower mitigation costs by taking early action, even if mitigation efforts in the rest of the world experience a delay. However, regions with low per-capita emissions which are net exporters of emission permits (such as India) can possibly benefit from higher future carbon prices resulting from a delay. 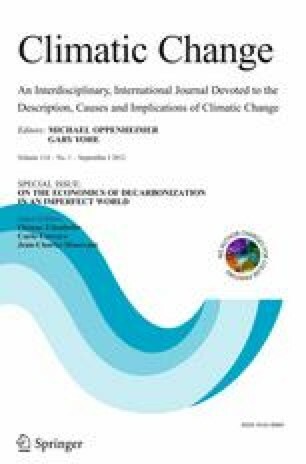 We illustrate the economic mechanism behind these observations and analyze how (1) lock-in of carbon intensive infrastructure, (2) differences in global carbon prices, and (3) changes in reduction commitments resulting from delayed action influence mitigation costs.